This particular period of time carried its own problems The new leader, who had a number of arrests, wants to leave a marked and innovative course. The reward for doing these was the respect of his people who followed his orders, trusting his ideas for the good of the commonwealth. San Jose de la Boca del Monte (it was the first name of the City of San Jose) had to be built – under the new leader rules – in the strongest city of the new Republic. Of course this would not be possible if its inhabitants continued to wander the valley. That kind of living feels at ease without relations between each others, due to the selfishness and greed of the landowners! The saying to justify-‘ was: “Everybody in their houses and God in all of them”; and because that belief that seems uncivilized, feed on a sick freedom, denying all solidarity and strong cohabitation. The liveliness that all people need is to be progressive, productive and caring for the progress. This issue had to be inverted. Soon, after he showed his strong directing side, the leader started to realize how San Jose de la Boca del Monte showed its firsts organizational signs that will lead them to a modernized city. And this was accomplished by the ruling of an intelligent, fatherly leader Although, the government was undeveloped, it offered the necessary bases to carry out the innovative project of making a city. How it could not be possible to fall into temptation of acquiring the necessities to make life more pleasant9 Those first pioneers, who were used to fight the adversity of an unattended colony of the Guatemala Kingdom, started to feel the necessary human heat to get rid of the segregation, which made life difficult for them. One lovely morning, in an Open Meeting, the neighbors decided to come down from the hills in order to fulfill the leaders orders. It was not liable to oppose his commands, so they did it gladly. They started by dividing the land into blocks to make enough land to hold four families. Immediately, they started c”La Fiesta del Barro” (mud Party) in order to build a well based and spacious houses made of sun-dried clay brick. The city was boiling with enthusiasm and hardworking; some were cutting and carrying wood from the mountains, others were churning mud with animals, and the smartest of them were knitting fabrics. And what about the ovens, that were built for common use by the women and getting ready to use*7 Some were cutting different kind of grass to give to the cattle and biscuits for everybody to enjoy. In less than a year, those hard working peasants were enjoying a nice house with milking houses and barns to store the season’s crops, as well as small part of land on which the family could grow their own crops and vegetables to sell at the market for a personal income. The laziness they once had, had now been changed into an organized com m unity. Then it happened that the Mother Nature seemed to test the newly built village, news from up North of the Country arrived announcing a plague of cholera creeping towards the village. 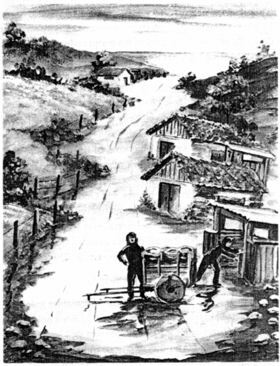 The alarm was in the village; at once, Juancho Pacheco went house by house in order to call to a meeting in Eduviges Brenes’ house. As it was expected, Juan de Dios, known as “Juancho”, an active and well spoken person, showed enough enthusiasm to motivate the people. ‘So, what should we do’ Don Eduviges asked? ‘Get together with the educated ones’ suggested Juancho., ‘if you let me do it I will ask him to tell me what we should do. ‘We are with you!’All of them said, and the meeting ended. The next day, early in the morning Juancho went to look for Dr. Gomez, who received him very warmly. ‘And who do you think could do the job? I don’t know, you are in charge, you must find that person. Juan de Dios, without loosing his time and as Chairman of the Health Committee of San Jose de la Boca del Monte, started to create the committee with really quick success, with the help of the Cubillo family and others. And he explained the job to be done, as cleaning toilets and other tasks. Daniel, the eldest asked ‘How do,you expect to do such a job Juancho? That can be easy fixed, Juancho reassured them. If you start the job after ten o’clock at night, when they are all asleep, no body will see you, not even when you take out the muck from their holes in the garden. Anyway, it’s a secret that will be kept with me. Then the job was started. The town folks were overjoyed to see their tanks empty in the mornings, but at the same time, the town was horrified by the occurrences during the night. After the lamplighter put out the lights, the whole town was left in a scary situation, because of the horrifing darkness. In the mornings, people told stories about how the chickens had been stolen, the nests were ransacked and pigs were slaughtered. And to everyones surprise, the girls were mysteriously getting pregnant and people were saying that it was the Holly Spirits job. Blasphemy! they were saying. To complete the story, the browe ones who dared go on a spree, come back late to their homes, appeared speechless and without sight. They all swore that they saw an ox less cart leaving the “crime scene”. And so many times this story was told, that people stared to believe that the town was haunted. “YES”, said my grandfather, after hearing the story, “my grandfather told me this story too, but he told the other part that nobody knows. The children that were born from those unfortunate girls mysteriously pregnant over night were in fact members of the Cubillo’s family. They were about one hundred in total, so for the next hundred years. The Cubillo’s family made up one third of the population without know-‘ing their sons secretly committed these “crimes” when finished their jobs of emptying the septic tank of the town. How about that9?